Accurate Window & Floor Cleaners was our original name when we started the business in 1970. 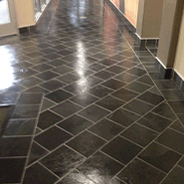 We have extensive knowledge on cleaning and refinishing different types of floors. We provide an environmentally friendly array of floor services such as machine wash, strip, wax and seal. Experience the benefits of having a protected and high gleam, slip resistance floor. We also remove and re-arrange all movable light furniture, as requested. Renew your floors shine! ..